Ferruccio Busoni (April 1, 1866 – July 27, 1924) was an Italian composer, piano virtuoso, music teacher, author, and conductor. His broad grasp of music combined the Italian and German musical backgrounds of his parents, and he used this heritage to produce many genres of music as well as a book which greatly influenced the later field of electronic music. Dante Michelangelo Benvenuto Ferruccio Busoni was born in Empoli in Italy, the only child of two professional musicians: his Italian–German mother was a pianist, his Italian father, a clarinetist. They were often touring during his childhood, and he was brought up in Trieste for the most part. Busoni was a child prodigy. He made his public debut on the piano with his parents, at the age of seven years old. A couple of years later he played some of his own compositions in Vienna where he heard Franz Liszt play, and met Liszt, Johannes Brahms and Anton Rubinstein. Busoni greatly admired Franz Liszt and cultivated his piano virtuosity imitating Liszt's style of performance. Busoni had a brief period of study in Graz where he conducted a performance of his own composition 'Stabat Mater' when he was twelve years old, before leaving to Leipzig in 1886. He subsequently held several teaching posts, the first in 1888 at Helsinki, where he met his wife, Gerda Sjöstrand, the daughter of a Swedish sculptor. He taught in Moscow in 1890, and in the United States from 1891 to 1894 where he also toured as a virtuoso pianist. In 1894 he settled in Berlin, giving a series of concerts there both as pianist and conductor. He particularly promoted contemporary music. He also continued to teach in a number of master classes at Wiemar, Germany, Vienna, Austria and Basel, Switzerland with one of his pupils being Egon Petri. His piano playing and philosophy of music influenced Claudio Arrau. In 1907, he penned his Sketch of a New Esthetic of Music, lamenting the traditional music "lawgivers," and predicting a future music that included the division of the octave into more than the traditional 12 degrees. His philosophy that "Music was born free; and to win freedom is its destiny," had a significant influence on his students such as Luigi Russolo, Percy Grainger and Edgard Varèse, all of whom played significant roles in the twentieth-century opening of music to all sound. 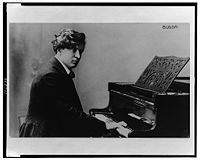 During World War I, Busoni lived first in Bologna, where he directed the conservatory, and later in Zürich. He refused to perform in any countries that were involved in the war. He returned to Berlin in 1920 where he gave master classes in composition. He had several composition pupils who went on to become famous, including Kurt Weill, Edgard Varèse and Stefan Wolpe. Busoni died in Berlin from a kidney disease. He was interred in the Städtischen Friedhof III, Berlin-Schöneberg, Stubenrauchstraße 43-45. He left a few recordings of his playing as well as a number of piano rolls. His compositions were largely neglected for many years after his death, but he was remembered as a great virtuoso and arranger of Bach for the piano. During the 1980s there was a revival of interest in his compositions. He is commemorated by a plaque at the site of his last residence in Berlin-Schöneberg, Viktoria-Luise-Platz 11, and by the Ferruccio Busoni International Competition. The majority of Busoni's works are for the piano. Busoni's music is typically counterpoint|contrapuntally complex, with several melodic lines unwinding at once. Although his music is never entirely atonal in the Schoenbergian sense, his later works are often in indeterminate keys. In the program notes for the premiere of his Sonatina seconda of 1912, Busoni calls the work senza tonalità (without tonality). Johann Sebastian Bach and Franz Liszt are often identified as key influences, though some of his music has a neo-classical bent, and includes melodies resembling those of Wolfgang Amadeus Mozart. Many of Busoni's works are based on music of the past, especially on the music of Johann Sebastian Bach. He arranged several of Bach's works for the piano, including the famous Toccata and Fugue in D Minor (originally for the organ) and the 'chaconne' from the Sonatas and partitas for solo violin in particular, the D minor violin partita. To create a viable work for Romantic piano from an original solo violin piece required a person of Busoni's boldness, inexorable feeling for musical geometry (which requires an in-depth knowledge of integrating chord structures together by parts), and distinctive sonority. Earlier Brahms had also made a transcription of the same chaconne, but for left hand only. Thus some consider him an originator of neoclassicism in music. The first version of Busoni's largest and best known solo piano work, Fantasia Contrappuntistica, was published in 1910. About half an hour in length, it is essentially an extended fantasy on the final incomplete fugue from Bach's The Art of Fugue. It uses several melodic figures found in Bach's work, most notably the BACH motif (B flat, A, C, B natural). Busoni revised the work a number of times and arranged it for two pianos. Versions have also been made for organ music and for orchestra. 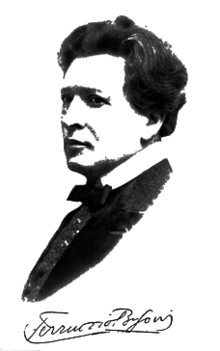 Not only did Busoni influence the world of piano virtuosity with his excellent piano technique and his ability to perform a composition with an uncanny understanding of what the composer was asking for, but when he heard about the accomplishments of an inventor of the "telharmonium," Busoni was overwhelmed. He saw the need for a new vision in music, and authored a book entitled a "Sketch of a New Aesthetic Music" in 1907 which indicated the need for the development of new instruments and a new understanding of the future of music. Ferruccio Busoni also edited musicical compositions by other composers. The best known of these is his edition of the complete Johann Sebastian Bach solo keyboard works, which he edited with the assistance of his students Egon Petri and Bruno Mugellini. He adds tempo markings, articulation and phrase markings, dynamics and metronome markings to the original Bach, as well as extensive performance suggestions. In the Goldberg Variations, for example, he suggests cutting eight of the variations for a "concert performance," as well as substantially rewriting many sections. The edition remains controversial, but has recently been reprinted. On a smaller scale, Busoni edited works by Ludwig van Beethoven, Johannes Brahms, Frédéric Chopin, Wolfgang Amadeus Mozart. Franz Liszt, Arnold Schoenberg and Robert Schumann. The Busoni version of Liszt's La Campanella was championed by pianists such as Ignaz Friedman and Josef Lhevinne, and more recently by John Ogdon. Busoni also mentions recording the Gounod-Liszt Faust Waltz in a letter to his wife in 1919. However, this recording was never released. Unfortunately, Busoni never recorded his original works for posterity. The value of these recordings in ascertaining Busoni's performance style is a matter of some dispute. Many of his colleagues and students expressed disappointment with the recordings and felt they did not truly represent Busoni's pianism. His student Egon Petri was horrified by the piano roll recordings when they first appeared on LP and said that it was a travesty of Busoni's playing. Similarly, Petri's student Gunnar Johansen who had heard Busoni play on several occasions, remarked, "Of Busoni's piano rolls and recordings, only Feux follets (Liszt's 5th Transcendental Etude) is really something unique. The rest is curiously unconvincing. The recordings, especially of Chopin, are a plain misalliance." However, Kaikhosru Sorabji, a fervent admirer, found the records to be the best piano recordings ever made when they were released. This page was last modified on 6 April 2017, at 16:17.